George Herman "Babe" Ruth Jr. (6 Februar 1895 – 16 August 1948) wis an American perfaisional basebaw player that's career in Major League Baseball (MLB) spanned 22 saisons, frae 1914 throu 1935. 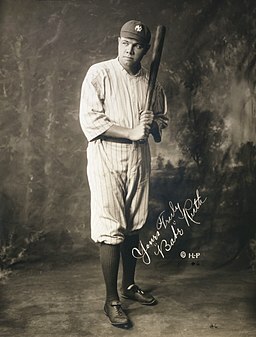 Nicknamed "The Bambino" an "The Sultan of Swat", he begoud his MLB career as a stellar left-haundit pitcher for the Boston Red Sox, but achieved his greatest fame as a sluggin ootfielder for the New York Yankees. Ruth established mony MLB battin (and some pitchin) records, includin career home runs (714), runs battit in (RBIs) (2,213), bases on baws (2,062), sluggin percentage (.690), and on-base plus sluggin (OPS) (1.164); the latter still staunds as o 2019[update]. Ruth is regairdit as ane o the greatest sport heroes in American cultur an is conseedert bi mony tae be the greatest basebaw player o aw time. ↑ Corcoran, Cliff (July 11, 2013). "99 cool facts about Babe Ruth". Sports Illustrated. Archived frae the oreeginal on February 8, 2014. Retrieved January 20, 2014. This page wis last eeditit on 23 Mairch 2019, at 06:13.